Please note display pictures are only for illustration purposes. They were not taken in real display rooms and do not represent the real size of the print set. They are just as an idea to help you being aware of how this canvas art print looks like in a room. Please measure your wall properly and make sure you pick the right size. Painting size:12x12inchx4(30x30cmx4).Each canvas art size can be personalized made.If you prefer your own photos/pictures print on canvas,please contact us directly. HIGH QUALITY:High-grade elegant high-quality plastic black photo frame wrapped in canvas print oil painting, you can easily replace the original unwanted painting, with a metal hook, easy to hang. 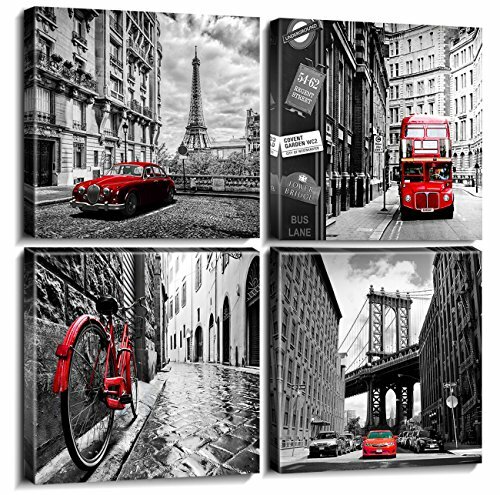 Classic and elegant design: the designer carefully selected black and white urban canvas wall art design theme. Such as the Brooklyn Bridge in the US; the Eiffel Tower in Paris;the quaint Stone Street in Italy, and the classic double-decker bus in the United Kingdom. IAn instant moment to our mind to another corner of the world, is every hobby travel home wall decorative paintings. Artwork that uses waterproof fade-resistant inks and premium synthetic canvas to keep it for years looks great. ATTRATIVE DECORATION:Black frame add elegant and concise appearance to the whole wall.A great choice for home living room bedroom kitchen dining room bathroom bar hotel restaurant office wall decoration.Perfect Christmas and New Year gifts for your relatives and friends. PROTECTIVE PACKAGING:Order with confidence,extremely carefully wrapped and packaged in custom cartons to avoid damage in transit. If you have any questions about this product by SUNFROWER ART, contact us by completing and submitting the form below. If you are looking for a specif part number, please include it with your message.